It’s hard to remember what you’ve never learned. For most students, Memorial Day is the time when the city pool opens, or they have their last three day weekend before the end of the school year. In order to teach the importance and solemnity of the day, here’s a ready-to-go lesson you can teach in about 30 min. You can easily create an unforgettable moment to help students think through the day and its meaning, and also teach some vocabulary, history, music and most importantly, some gratitude along the way. 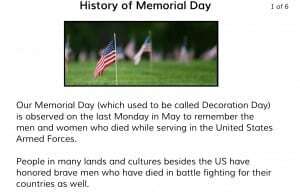 We begin by learning how Memorial Day began. You may be surprised to learn that it began with freed slaves taking the time to bury the bodies of the soldiers who had sacrificed so they could enjoy freedom. This would be great inspiration for a journal entry or and diving board into a history lesson on the Civil War. With the upload feature, your students can add digital images of their family members and friends who have served to make the event personal. You can even add sound files (interviews or tributes) that your students have created to add to the classroom “honor” time. There’s nothing technical to doing it. You could also take a few minutes to sing along with patriotic songs and you don’t even need a piano player or be able to carry a tune. Included is the Gynzy Juke Box all ready to go. 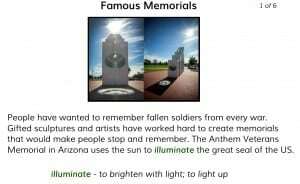 Its five pillars represent the unity of the five branches of the United States military serving steadfast together. They are staggered in size with their appropriate military seal placements on each pillar. 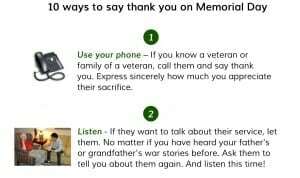 There are 10 helpful ways to let your students say thank you to those who have served and are serving included in the lesson. Even if you only have time to use one or two of them during class, you can fill your student’s minds with ideas for more ways that they can follow through on their own. The quiz at the end of the lesson is a great wrap up and will show you what they learned through this great lesson. If we want them to remember, we have to help them put this knowledge in their mental file cabinet. This lesson is one I believe you will want to keep year after year as a digital scrapbook. Just keep adding special moments and every year it will be ready to accomplish one of our most important tasks: creating respectful and grateful citizens who know the value of freedom.